Nissan revived the old Nissan 200SX in US and Canada in the spring of 1995. It was introduced in three trim levels; the base model, SE and the SE-R model. All models share a front-end chassis and appearance, the same style dashboard and many other dimensions with the Nissan Sentra. Both base and the SE trim models have a 1.6 Liter 4-cylinder engine, whereas the SE-R version has a 2.0 Liter engine with 140 horsepower. All three models come with either 4 speed automatic or 5-speed manual transmission. Nissan 200SX was available in US and Canada from 1995 to 1998, with minor changes made every year. The Nissan 200SX has mostly positive reviews amongst its users. The well shaped bucket seats and the extra front leg room space provides excellent comfort and support to the driver and any passengers. 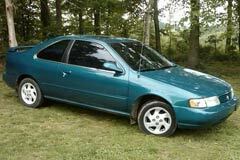 The used Nissan 200SX is the perfect vehicle for someone looking for a reliable car at a low price.